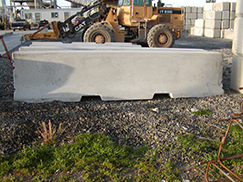 Ultrablock offers protective concrete barriers used as dividers, and a means of preventing access to prohibited areas. Jersey barriers are used for construction sites, traffic channelizing, road blocks, object protection, wall protection and pedestrian traffic. Barriers utilize a steel rebar cage; reinforced barriers have a tongue and groove line-up connection. These barriers are NOT approved by DOT for highway use, but are an economical alternative where a barricade is necessary.